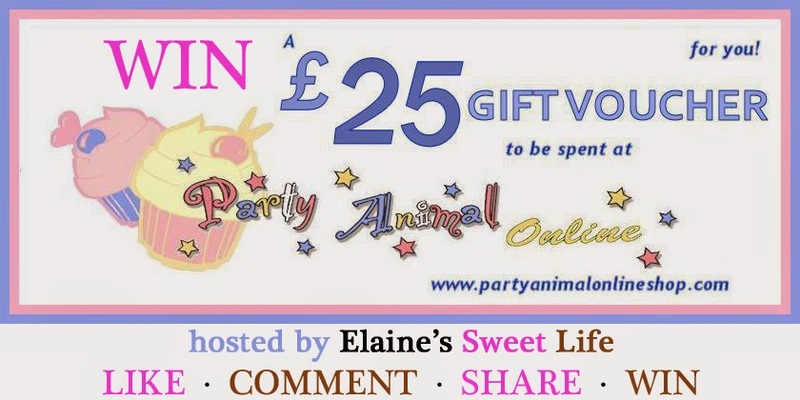 To celebrate passing the 500 fan mark on our Facebook page, we are giving away a £25 voucher to spend on anything you like at PartyAnimalOnline! This giveaway is open worldwide to all Elaine's Sweet Life Facebook fans. Enter below to win! You have options for 8 entries each. * Please ensure that you follow the instructions for each entry, or your entry will be invalid. Feel free to ask any questions to do with this competition on our Facebook page or on our Blog. The voucher will be issued to the winner by email. A £5 voucher will be added to the prize if the winner resides outside the UK, to supplement additional shipping costs. Please can you do a tutorial on how you made the noahs ark cake. How did you make the wood? That sounds like a good tutorial to do, thanks Melissa. And I'll be sure to do a post on making fondant look like wood, you won't believe how easy it actually is! Hi! I am like you and love my crafts, especially sewing, but would love to know how to begin felting and crocht, so some info on how to get started, etc would be fab! I'd love to know how you made the Darth Vader cake. Your cakes are wonderful. Thank you Megan. This is something I've been asked before as well. Darth Vader was one of my trickier cakes, but having done it once, I'm sure I can put a tutorial together. This one will have to wait a bit until my arm and shoulder are feeling better though. More step by step recipes! For the yummy looking desserts you make. Thanks Kim. I will definitely try and do more tutorials! Any in particular you would like to see? More step by step recipes, more pics. Luv your cakes. Fab, splendid, 2 fingers snap. . Thanks for the awesomeness, the contest, & generosity. More step by step recipes! Step by step tutorials and recipes are great! Good Luck :) I am working on some tutorials at the moment! Im a new fan, and I m very happy to follow your beautiful world! Your cakes looks delicious!So i like recipes. Congrats for your all your fans! I would like tutorials to show my grandchildren how to bake. Baking with children is great fun, I will see what I can come up with! I love party food, I'll be sure to share some of those recipes! I'm thinking Xmas already and am struggling to find a traditional Xmas cake recipe that is easy to follow! Some tutorials on chocolate would be fab!